Inventory management is an unsung but critical part of running restaurants and cafeterias. To quickly add space for non-refrigerated ingredients like canned goods, more and more businesses are turning conex containers into restaurant storerooms. A shipping container storeroom can be placed on the property in less than an hour and often offers considerable savings over renovations. The larger, more organized storage space extends the time between deliveries and save employees the headache of searching through clutter. 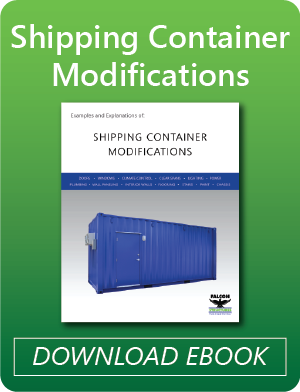 Plus, modifications, including insulation, HVAC and rodent-proof seals make conex containers a code-compliant solution for dry goods storage. If you’re considering creating a restaurant storeroom in a conex container, here are a few quick steps to determining the best configuration for your business. Step 1) Assess how much shelving your conex storeroom needs. Health inspectors recommend keeping all dry goods on shelving. The lowest shelf should be at least six inches off the ground to prevent pest infestations, and the highest shelf should be no higher than seven feet to keep the goods accessible to employees. Say a restaurant serves 2000 meals between dry ingredient deliveries, and each meal requires about .05 cubic feet of dry ingredients. Falcon’s standard shelves are 1.5 feet deep and have 1.5 feet of clearance. Because not every item will fit snugly on the shelves, let’s assume the shelves are packed with 80% efficiency. Based on this estimate, the restaurant needs 55.6 linear feet of shelving to hold its dry goods. To determine the best size and configuration for the conex storeroom, refer to our chart of popular storage container configurations. A 20-foot shipping container with one wall of shelving would comfortably hold all the restaurant’s dry ingredients. The hypothetical restaurant owner may also consider using a second wall of shelving to securely store non-perishable goods like paper towels, napkins, table clothes, plastic utensils, and more. Step 2) Determine your conex storeroom’s temperature control needs. The legal requirements for dry goods storage vary with the restaurant’s jurisdiction. Some states and jurisdictions require that dry ingredients be kept in temperature-controlled storage no hotter than 70 degrees. Others simply require that the space appears clean and free of pests. Even if your restaurant is not legally required to create a climate-controlled storeroom, there are numerous benefits to doing so. Keeping canned and packaged foods at 50 degrees maximizes shelf life and better preserves nutrients and flavor. Reducing spoilage and maximizing quality will save money in the long run. Temperature control systems also have the added benefit of preventing mold by ventilating and dehumidifying the storage space. 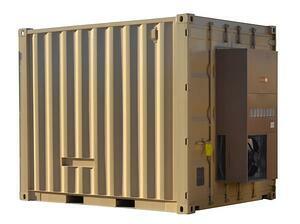 A conex container insulated with styrofoam and cooled by HVAC will consistently keep dry goods within 50-70 degrees. If you’re storing sensitive goods like wine, consider modifying the container to have a specialty air-conditioner paired with spray foam insulation. Step 3) Evaluate the best location for your conex storeroom. 10 feet long X 8 feet wide (80 square-feet). 20 feet long X 8 feet wide (160 square-feet). 40 feet long X 8 feet wide (320 square-feet). Generally, restaurants will place conex storerooms behind their buildings. So long as the space is dry, flat, level, and accessible by truck, the container can live there. Conex containers can also be placed indoors on concrete floors. For instance, large cafeterias and food processing plants may choose to augment existing space in their facilities with a containerized storeroom. Mobile containers used strictly by employees for storage will probably not be considered an occupied structure, making permitting relatively simple. However, be aware that some cities have zoning and size restrictions on shipping container structures. To prevent permitting issues, always check your local authority having jurisdiction’s container policies before moving forward with modifications. We hope you found these tips helpful. If you have more questions about shipping container storerooms, contact us at 877-704-0177 or email sales@falconstructures.com. We’re happy to answer your questions.